First, there is no right or wrong way to make this cane. I make it differently than some people, and I know that some people will make it differently than me. That’s okay. Once you can get the Skinner Blend mastered, it’s all a matter of using your sculpting skills to gently “persuade” the clay to do what YOU want it to do. 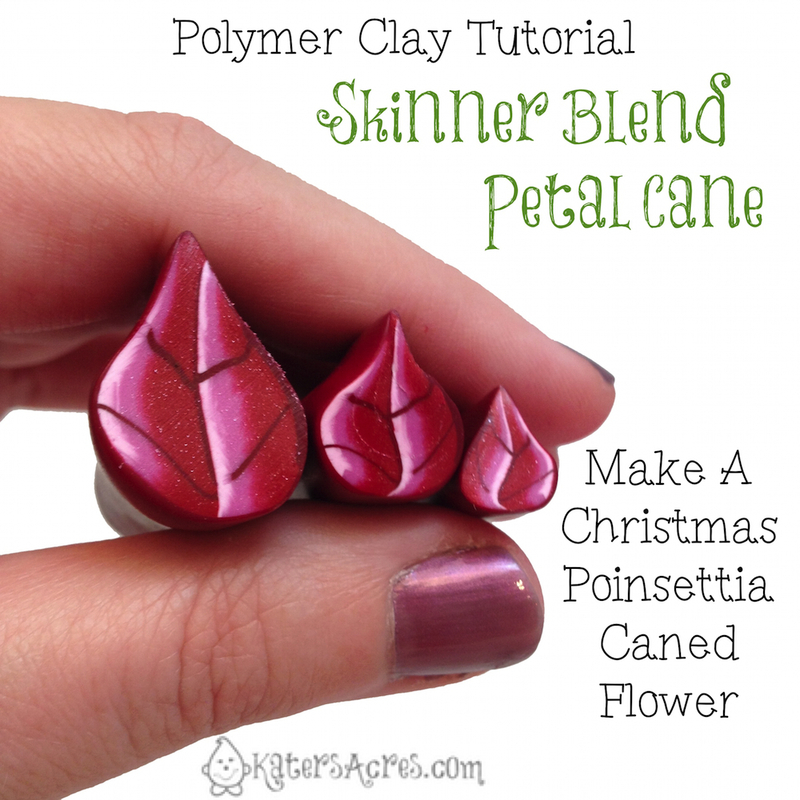 The following tutorial is PART 1 in making a caned Poinsettia petals & leaves. What is a Skinner Blend? A Skinner blend is a way of combining two colors to create a variegated palette that is unique, blended, and can be seamless with enough patience and effort. The old term for this used to be a gradation … today people sometimes refer to it as an “ombre” effect. This effect can be achieve with similar colors (as show below) or with opposing colors to create new & unusual blends. Sculpey has a fantastic post with more information on Skinner blends, including how to make one using the “traditional techniques..
First, select two colors of Premo! 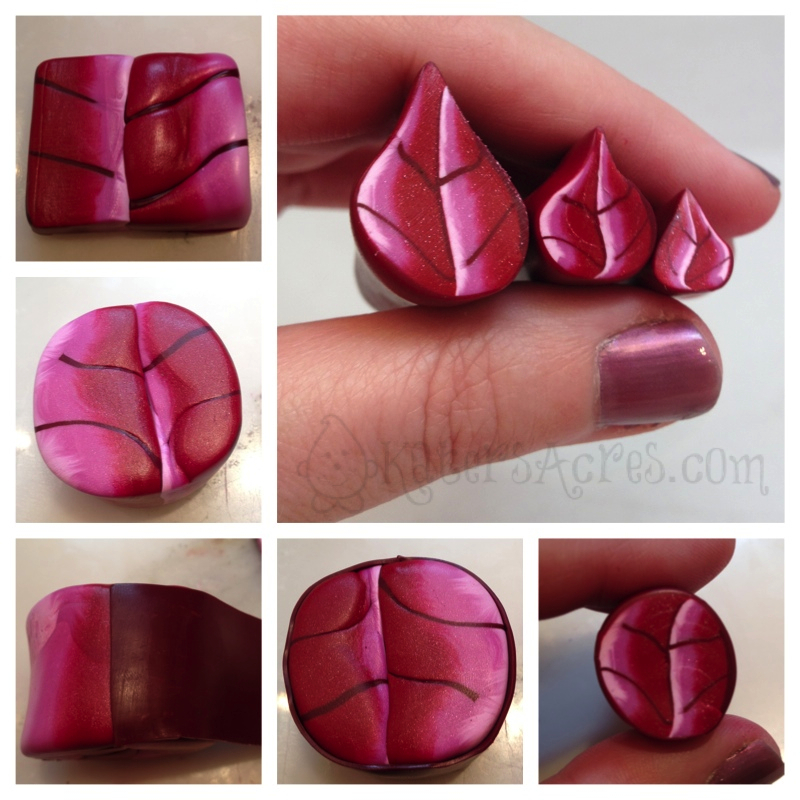 polymer clay that resemble the colors of a poinsettia. NOTE: I chose Premo! Red Pearl the original Premo! Metallic Mauve with a scrap of white I had sitting on my work surface. Next, cut each block in half. NOTE: By cutting each block in half you will end up with a 50/50 blend. 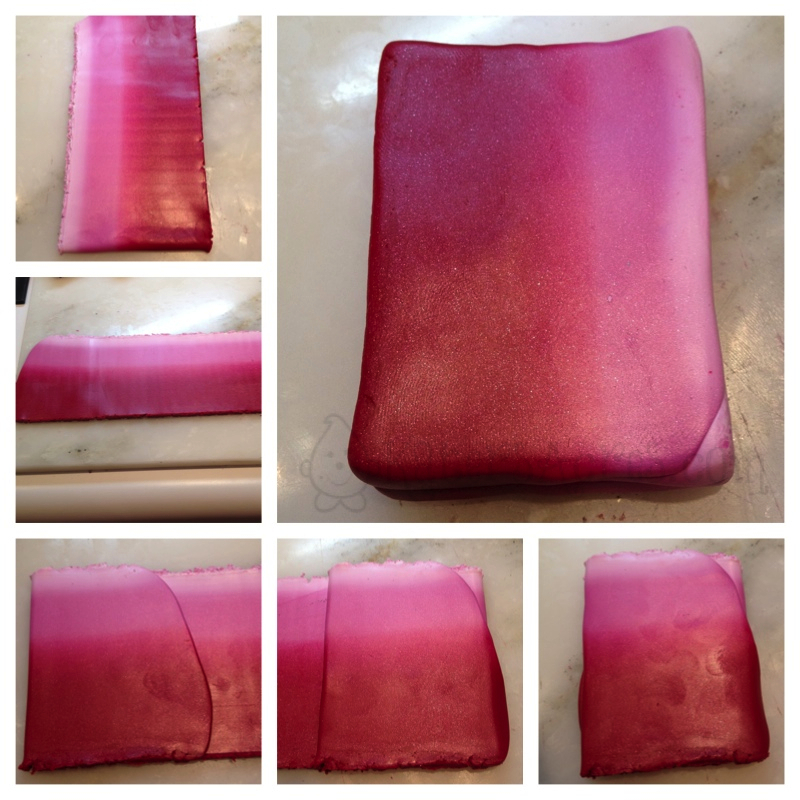 I instead used 1/2 block and about 1/3 block of clay so there would be LESS pink than red in my blend. You can vary the leaf by changing the proportions of clay you use in making your skinner blend. To create your skinner blend, form to triangles of clay. NOTE: I have used the Leitz Teardrop Method (CLICK the link above to watch a demonstration on YouTube). Once you have formed your teardrops, roll them out flatter to fit through the largest setting on your pasta machine, using your acrylic roller. Then begin to roll your blend through the pasta machine. Always keep your colors lined up (red on red, pink on pink, etc)! If you turn your blend, you WILL ruin it. NOTE: I wanted to control the size of my blend, so you can see that I used my pasta machine wedge. (Get the tutorial here) By using the wedge, I control the size of the blend so I can turn the blend into a block much easier. Continue to roll this blend through the pasta machine, matching like colors, about 25-40 times. NOTE: The more your roll the blend through your pasta machine, the more gradated the color palette will be. I only rolled mine about 25 times, it could have been rolled through the machine more, but I wanted a harsher “edge line” on my leaves. When you are finished (you decide how gradated you want your blend to be) you should have a LONG strip of clay. In the next step we are going to turn this long strip of clay into a block that will form the base for our petals. Now it’s time to take that blend and turn it into a block! First, take that strip and make it as flat as possible. Next fold up a section of the blend and match it color to color. Gently ROLL over this fold with your acrylic roller to get all the air out. Continue folding the clay in an “accordion pattern” back and forth, in on itself. NOTE: Meg Newberg has a video on turning a blend into a block. CLICK here to watch it on YouTube. When it is finished you will have a misshapen block made for your accordion folds. Do you best to shape this block back into a rectangle so you can add the middle vein and petal veins to your poinsettia petal cane. Now it’s time to take that block and give it veins! Decide how you want your petals to look, light color on the inside, outside edges, etc. The side that you choose to be the “middle vein” of your leaf will require your 3 color of clay. NOTE: I used Premo! Alizarine Crimson. First square up your cane. NOTE: If you can not do this by manipulating the clay into place, simply cut it off and set the pieces aside; do NOT discard your scraps. Cut off a section of your 3rd color block (about 1/4 a block). Run this through a medium setting on your pasta machine to create a long strip. Place the side of the block where you want the MIDDLE vein to be, and add a strip the exact same length and width as your block. Again add a strip of your 3rd color to the block. NOTE: In ONE strip I shortened the line by adding back a piece of the blend in the pink/white blend from the portions I trimmed. The easiest way I have found to manipulate a square cane (that’s a full block of clay big) is to use an acrylic block. Not only does this ease the work on your hands, but helps to keep your cane square. Place your acrylic block parallel to your work surface. Square your clay block against the acrylic. Using your dominant hand, hold the acrylic block in place, while gently “smooching” the rest of the cane with the palm of your other hand. After every time you “square” your cane, rotate it one quarter of a turn to keep your block square. When your block is half the size it was when you started, turn your block on it’s side and cut it perfectly down the middle. At this point you will now have 2 pieces of petal cane. Now it’s time to turn this block that doesn’t look like much into a petal cane! Again, using the Acrylic Block method mentioned above, continue to reduce this square cane by pushing and gently pulling. When your clay is large enough to grip firmly, grab the block between your thumb and index finger, making an “o” and begin to SQUISH the square into a circle. NOTE: Do this slowly so you do not generate a lot of waste. If you do generate waste, there will be some, do not worry. We will keep it to use for another project. ADDENDUM: I did NOT want a “perfect” flower petal so I was NOT worried if some of the lines were “fuzzy.” Why? I’ve spent a lot of time around flowers and every petal is different, so it will be with this cane. When you have obtained the size cane you want, cut a piece off. Make as many different sizes of petals for your cane NOW because they can only be made smaller, but it’s very difficult to make them bigger again. When you have all your sections cut, gently sculpt the round cane into a petal or leaf shape. NOTE: I made 3 petal canes, large, medium, and small to accompany the varying sizes of petals in a poinsettia. Please know that every artist makes their canes differently, this is how I made this one. If you know an alternative or better way, please leave your comment below.